The 19th Annual Harvard University Pow Wow will feature Cazenovia College senior Vince Halsey’s designs in its promotional materials. 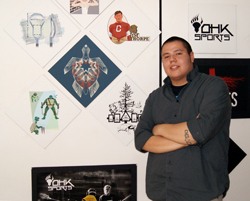 Halsey, a visual communications/graphic design major from Oneida, N.Y., and member of the Oneida Nation, was the winning designer in a nationwide contest that sought artwork for print materials, social media and apparel. The Pow Wow, scheduled for May 3, 2014, on Radcliffe Yard at Harvard University’s campus, will bring together Alaska Native, Native American and Native Hawaiian students and individuals in the Harvard community. Event attendees will get to view Halsey’s turtle-inspired design. For more information on the event and to view Halsey’s designs, visit http://hunap.harvard.edu/harvard-powwow.